Dinnertime again, with just one hour for me to make food and for all of us to finish eating it. 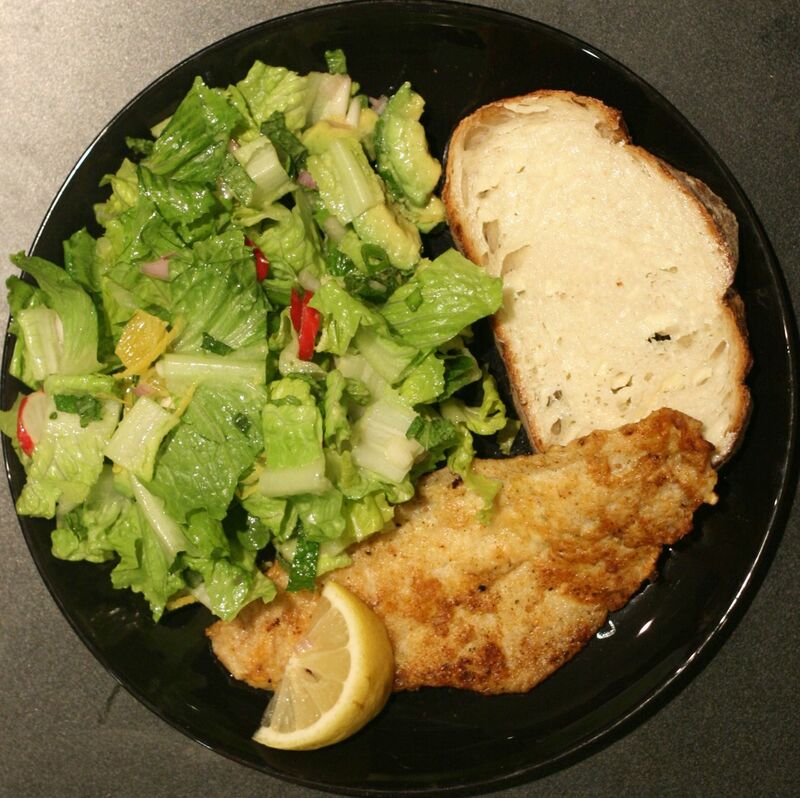 Luckily, my husband was home and he pitched in — he pan fried our wild snapper fillets and sliced the bread. I made the salad. I knew I wanted something light and lemony, with lots of crunch. I was hoping the kids would enjoy it as well, since I didn’t have time to deal with broccoli or any of their other favorite veggies, and they’d already polished off a five pound bag of mandarins for lunch. I used romaine as a base, for the crunchy, clean flavor that my munchkins prefer. I added a navel orange for bright color and juiciness, avocado for creamy deliciousness, scallions for a mild onion tang, and radishes for more color and that perfect peppery crunch. I also mixed up a lemon shallot citronette, and grabbed a handful of mint for the salad. Mint is an excellent brightener, and it works incredibly well with any citronette. I wanted the salad to be really clean and simple, to complement the fish, and to appeal to the kids. Rainbow of ingredients, ready for action. 1 navel orange, peel sliced off, quartered and sliced, for maximum shiny jewel appeal. 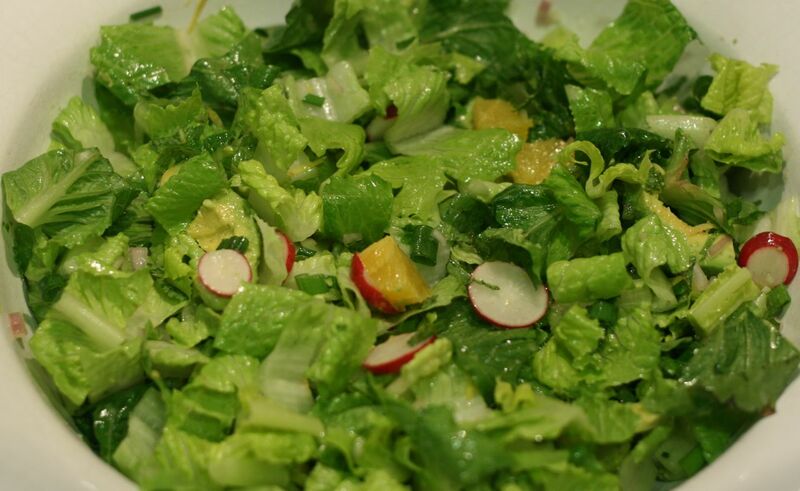 The finished salad, tossed and ready to serve. I dealt with the lettuce first, making a nice base in the bowl. I zested the lemon over the lettuce, juiced the lemon, and made the citronette. My shallot was on the large side, and I thought about using half of it instead of all of it, but tossed it all in on a whim. I chopped and sliced the rest of the fruit and veggies, added them to the bowl, and then drizzled it all with citronette. While I tossed the salad, my husband started dishing up the fish and bread. My kids asked for salad, and two of the three came back for generous second servings. In case you missed it above, let me repeat: my kids asked for salad, and two of the three actually came back for seconds. Yes. Total success. This salad rocked. It was incredible with the fish. Light, perfect flavors. Just the right combination of crunchy and barely sweet. Really delicious. My husband and I agreed that it was a real winner. I do think in the future I’ll use less shallot, but the extra just coated the bowl and didn’t end up having any impact on the salad itself, so it isn’t really a big deal. It’s a very light, bright salad. I think if I were making it a meal on it’s own, I’d want something simple to add — grilled shrimp would be really good, or any other simple seafood. I think it would also work with grilled chicken. For a vegetarian version, I’m always a fan of garbanzo beans and lemon, although if I added chick peas I would cut out the avocado, or add another crunchy element, and I would swap garlic for shallots in the citronette… So that turns it into a completely different salad pretty quickly. I think shelled edamame would work well without any other changes, or some tasty toasted nuts. Easy enough — the orange goes in the jar with the dressing so that it’s juices don’t wilt the romaine. If you add protein to make it a stand alone meal, put the beans, chicken, fish or shrimp, (chilled, not hot, since heat also wilts lettuce) in the salad container. As always, leave space for fork tossing and combine it all when you’re ready to eat. Use your fork to pull the fruit out of the dressing so you aren’t forced to use all the citronette — remember, you might not want it all. Always add your dressing a little at a time, to taste.